Don’t let summer camping become a nightmare or feel like hell for everyone onboard your recreational vehicle because you don’t have the best RV air conditioner. This especially designed and made RV appliance is what can keep the comfort and ideal temperature in your rig. It is also made of high quality and durable components to deal with outdoor conditions and elements, including snow, rain, sun and wind, ensuring its longer lifespan than typical home air con models possess. If you’ve bumped into this guide, chances are you’re looking for a recreational vehicle air conditioner with the right cooling capacity and functions that will keep everyone aboard happy and comfortable. So are you ready to pick the best AC for your rig? Keep reading the following for the top picks in the category as well as a buying guide for your reference later. Also, we’re featuring frequently asked questions when buying an RV air conditioner. You don’t need to deal with the summer heat aboard your recreational vehicle if you have the Dometic B57915.XX1C0. It is one of the most efficient and reliable units, which is highly rated as one of the top picks when it comes to the quietest RV air conditioner. The Brisk II is yours if you’re looking for a great AC for your RV that has a top technology and energy saving features. I would like to recommend this air conditioner as one of the best in class for small and low profile AC that can keep your rig cool and your loved ones feeling comfortable. One of the things I also liked about the Brisk II is its 15 percent starting increased airflow 15 percent. I would also like to recommend this unit for its improved cooling capacity aside from being a stronger and cooler choice for your recreational vehicle. You will also have no problem that it will add weight to your rig because the revolutionary AC is also one of the lightest on the market. So when it comes to being solid and compact, it is one of the favorite choices among recreational vehicle owners. I also liked that it has a durable design that can keep up with harsh outdoor conditions, including frequent vibrations and shocks when the vehicle is on the road. This unit already comes with dampening brackets that work to reduce vibration and noise. It also comes with a new base pan and more structure, making it one of the most reliable RV AC picks around. You will not also have a hard time when it comes to noise because this model also has a quiet fan and motor. Speaking of its motor, I would like to note that it’s one of the strongest around for its high performance and efficiency. Before I forgot, this unit also offers an easy installation for its compact size and straightforward design. The one-phase AC unit has a rating of 115V AC power and 60 Hz. On a drawback, this product is expensive. Are you shopping around for the most efficient RV air conditioner? You should look for efficient features such as an increased airflow and great cooling capacity. One of those I found to fit the criteria is the Airxcel 48204C866, having impressive qualities to become a part of this list of the top RV air conditioners. One thing I found impressive about this model is its compact and small size, yet it has a very high cooling output. 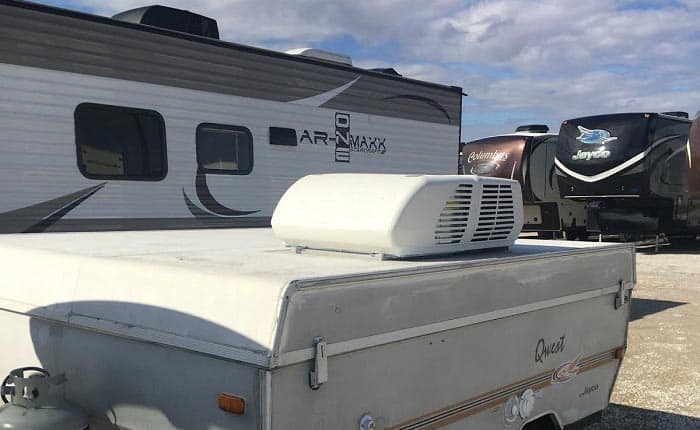 The MACH is a powerful AC that offers a very strong airflow, keeping your vehicle cool especially in the punishing hot temperatures of the summer when things can be really frustrating if the temperature inside your recreational vehicle is excessively high to make your loved ones feeling comfortable. The Mach 15 is also highly recommended for its solid and streamlined shape, which can improve its cooling efficiency and airflow. When it comes to durability, I also find the RV air con impressive because it is made with gas-flux brazed joints and all copper tubing. Both of these can help in extending the life of the AC. So if you’re looking for a reliable air conditioner, the Airxcel 48204C866 is designed with condenser coils that have raised LANCE fins and large evaporator. Both of these are adding to the reliability of the system when it comes to heat dissipation. The shroud of the unit also comes with condenser coil protection. 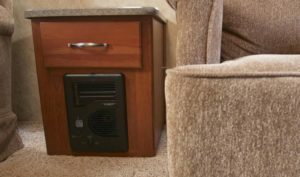 And whether or not you’re looking for the biggest RV air conditioner, you might want to consider the MACH 15 as one of the top choices because it is also impressive for its optional heater assembly that you can add to supply heat up to 5, 600 Btu H.
Overall, the unit with a 1/3 HP fan motor and offering 320 CFM airflow is one of the top picks on the market for its long lifespan, excellent design and powerful performance. On a little drawback, the RV AC is heavy, though. If you’re looking for a low profile and powerful RV air conditioner that works perfectly in cooling your rig, you might want to consider taking a second look at the Dometic 640315C. It is one of the best RV air conditioner units for its excellent performance and large cooling capacity. 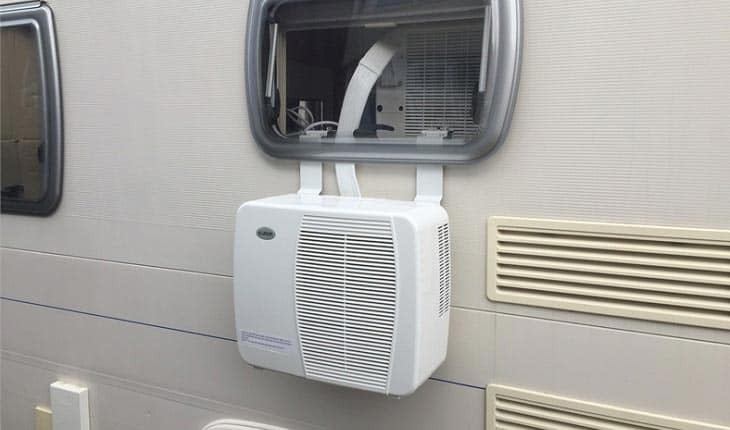 The polar white air conditioner for the RV’s rooftop is also a highly rated product on the market that has top technology making use of R410A refrigerant. It is one of the latest innovations in air conditioning because it is able to release heating that is more efficient. The rooftop air conditioner also has an excellent design, boasting a futuristic look that is complementing to any decoration and theme in your recreational vehicle. You will also love that it has a low profile – only below 10 inches in height. It works excellently, yet it looks modern and sleek. This air conditioning unit also boasts its modern shroud design, which adds to its quiet operation. The nice shroud build can reduce the drag and reduce noise and vibration. This unit also comes with a redesigned base pan that has ribs, which further add to the beauty and strength of the Penguin II. While the unit is also a non-ducted, model and is compatible to work with an air distribution kit and control kit, you have to buy these separately. That’s one downside of this unit. But then, the overall performance and durability of this unit are really worth the purchase. Overall, the Dometic 640315C is a decent choice for its top technology of using the R410 refrigerant, which is able to release heat better. It also has a good design that can fit roof openings in many types of recreational vehicles. On the negative side, this air conditioning unit is a bit tricky to install. The Atwood 15026 Air Command 15K is one of the most reliable non-ducted units on the market that can be compared to the best RV ducted air conditioner because it is a complete unit that already comes with a heat pump that you can rely on for top performance. The roof only unit is also a recommended one because it is built to last for its durable and high quality materials, which are working together to deal with the tough conditions in your rig, including shocks and vibrations. While it is sturdy, the manufacturer didn’t also leave its top performance aspects including a large cooling capacity. This compact and low profile unit is able to deliver the coolest air. So whenever you and your loved ones are camping in the summer, you don’t have to worry about keeping them feeling comfortable. This unit can cool your space efficiently at a rate of 360 cubic feet/minute. I also noticed that this unit is able to provide the features and functions that are even better than other air conditioners on the market now. This air con is also easy to operate for its IR Remote Control that lets you adjust the settings based on your preferences. Just as what you can read from Atwood RV air conditioner reviews, this unit also has a standard heat pump that makes it even more efficient in releasing heat. The Atwood 15026 also comes with a digital thermostat, which makes the unit more efficient in improving cooling and keeping ideal temperature in your rig. This unit also fits most standard roof openings with 14″ x 14″ cutout dimensions, making it ideal for most RV installations. The brand is also one of the best in the industry when it comes to non-ducted and ducted air conditioners. On two drawbacks, this unit is a bit bulky and heavy, though. It also needs an Atwood 15021 ceiling assembly. Even so, this AC for the recreational vehicle is one of the most dependable around for it is rated at 15,000 BTU. Its base pan might not be that durable. 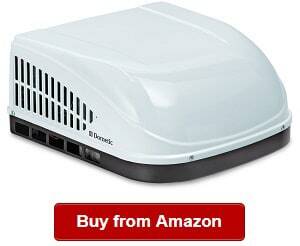 When shopping around for the best RV ac unit, you might want to consider the Brisk Air Ii 15.0 Black Upper AC unit. 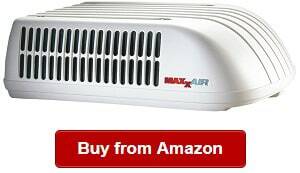 It is one of my recommended ACs for recreational vehicle owners looking to make use a smaller and lighter air conditioner. As you might already know, using a light and small air conditioner is important. For one, it won’t add much weight to your rig, saving you fuel and reducing pressure on your RV. It is also an environmental-friendly RV air con that ensures it does not only perform well but also does not harm the environment for its energy-efficiency. This unit also has an excellent design, which also has improved materials and better specifications, all working towards maximized performance and airflow in your rig. 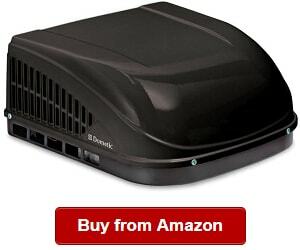 In addition, the Dometic Brisk II supplies 15 percent airflow increase that improves cooling efficiency. 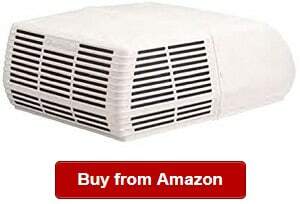 It is also one of the smallest in the category when it comes to lightweight and small AC unit. The RV A/C unit can fit standard air vents measuring 14 x 14 inches. When it comes to improved cooling capacity and increased airflow, you can also depend on the unit that is able to cool your rig efficiently to provide comfort of your loved ones. I also liked that this AC comes with rigid shroud and a base pan that adds to the durability of the A/C unit. This unit can also work compatibly with a domestic ADB or air distribution box, single zone LCD thermostat/comfort control center II and return air grill of the brand. All of these are sold separately. You can also choose your preferred color either white or black, so you have the option of selecting which one will fit your RV decoration. And aside from RV air conditioner troubleshooting support, you can also rely on the model that is backed by a two-year protection plus warranty. This unit is also easy to maintain and install, making it an ideal choice for many recreational vehicle owners. On the negative side, its base pan might not be that durable. This unit is as good as a Coleman RV air conditioner when it comes to reliability and performance. You can depend on its power of 15000 BTUs, ensuring its supreme power that you can count on for an RV air conditioner. I would also like to recommend the AC for its three fan speeds that you can adjust based on your preference. It is a high quality unit, which is designed and created to last long for its durable materials, which can deal with the rough environments in a recreational vehicle. It has the components that can withstand vibrations and shocks that can give you the most bang of your buck on the investment. The rooftop air con also has a watertight vent-opening gasket, which adds to its durability. The gasket is also designed with foam support pads, too. I also liked the Advent ACM150 because it has a large cooling capacity that makes it efficient in keeping the cool temperature in your rig. With that said you could be certain that your family will be able to enjoy your camping and experience comfort while aboard. I would also like to recommend the unit for its tough and rigid metal base pan, which adds to the durability of the product. In addition, this product is highly recommended for its top quality materials, which are making use of the latest technology. Overall, it is one of the high quality RV air conditioners that can offer supreme comfort for your loved ones when camping in the summer. Your loved ones will not only enjoy your outdoor adventure, but they can also have peace of mind of experiencing cool RV temperature throughout the day and night. It has the solid features and functions, including a large cooling capacity, sturdy components and excellent design. So if you’re shopping around for a reliable RV air conditioner, you might want to consider the Advent ACM150. In addition, the product offers flexibility, letting you use an optional plug in heat strip if you need it. Using the latest technology, this AC unit for your recreational vehicle is one of the best choices for those looking for a top performing and durable air con. I also liked that it is lightweight at only 550 lbs. On a drawback, this air con is a bit more expensive than other models in the same category are. 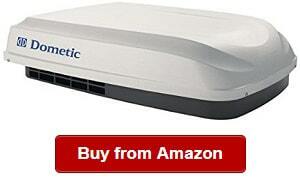 Are you looking for a small RV air conditioner that offers great performance? You might want to take a second look at the Mach 3 air conditioner for the recreational vehicle. One thing I liked about the air con is that it offers a cooling and heating capacity of 13,500 BTU. Another thing I liked about this mode is that it’s using an eco-friendly technology R-410A refrigerant to ensure that it is efficient and at the same time does not harm the environment. It works efficiently to ensure that it can keep the ideal temperature in the rig. This model, which is a part of the Mach line series, is also one of the most powerful among Coleman air conditioners on the market now. Another thing I liked about the unit is that it is one of those with the best conditioning values versus other products out there. The Mach 3 PLUS air con is designed with condenser coils and large evaporator for a better heat dissipation. One feature that makes their function better is the raised lance fins. In addition, you can count on its reliability in operation because it is easy to operate and performs excellently, which is one of the reasons it’s chosen by many RV owners. 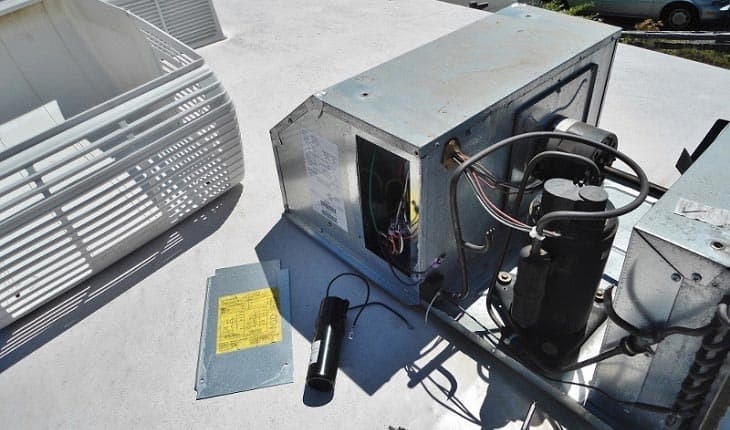 Another thing I liked about the MACH 3 air conditioner is that it is designed with sturdy brazed joints and copper tubing, both contributing to the longer lifespan of the unit. And not to forget, the RV AC unit also comes with a condenser coil protection on its shroud. You will also love that increased airflow reaching 320 CFM/minute. Overall, this AC unit is a great pick for its solid performance and sleek design that makes it one of the right RV air conditioners that your loved ones will surely appreciate. On two drawbacks, this product is a bit bulky. Also, you might have to buy a heater assembly for 5,600 BTUHs of heat that will result to cooler outings. But then, its great features and functions outweigh this flaw. The DOMETIC 651816 651816.CXX1C0 is another top choice for an RV air conditioner because it is designed and built to perform and deliver cooling to your rig consistently. It is a big AC model for the RV that you might want to consider if you have a bigger vehicle. When trying to compare different AC specifications, such as Coleman RV air conditioner specifications, you should also consider your needs. 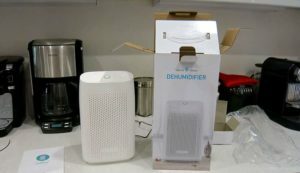 One thing I liked about the Dometic model is that it is powerful rated at 15,000 BTU, but then it is operating on a minimal energy circuit at only 1500 W and 120 V. Another reason I would like to recommend this AC unit is its integrated heater that you can count on for its solid performance. It is also making use of the latest technology to ensure that it will be energy efficient and environmental friendly. I would also like to recommend the unity if you are a frequent RV adventurer that love to visit places with cooler weather. Another thing I liked about the AC unit is its low and slim profile, which makes it an excellent choice for RV owners that are looking to make use of an AC that has a modern design. The slim profile is also perfect for RVs because it ensures of fuel efficiency especially if you’re always going on long hauls. The ducted type air conditioner is ideal for the tough outdoor conditions, including shocks and vibrations. Nevertheless, it is a dependable unit that can offer you top advantages of using a top performing AC that can maintain the ideal temperature in your rig. The ducted type AC is ideal for RVs because it requires 120V and 1500 watts. It also offers a heating function that can ensure of its efficiency in keeping the ideal RV temperature. This package also includes a gasket and digital controls that can work with the comfort control center. 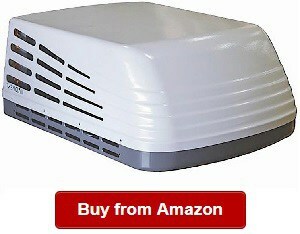 I would also like to note that the RV air con is compatible to fit into a roof vent opening measuring 14 inches. The unit also works with air box installation and ducted installation. On a drawback, this product is costly, but for its solid features, it is worth the investment. In addition, you might have to buy a new control board conversion or CCC2 TSTAT to use this AC in a ducted system. 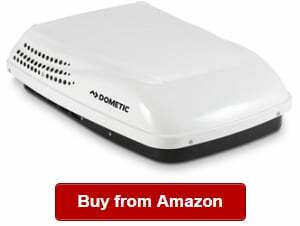 The Dometic Sanitation 143002P041 is another top contender to become one of most durable RV air conditioners for its solid performance and heavy-duty materials. 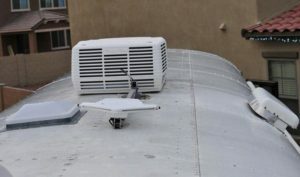 The RV rooftop air conditioner is an appealing product for many RV owners because it has the solid design and top quality components that make it a durable choice. It can deal with the tough RV conditions, including frequent shocks and vibrations, meaning it’s long lasting for many years of service. According to some customer reviews, they also loved that the RV air conditioner was easy to install. 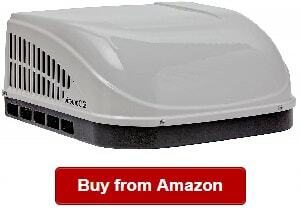 Versus other ACs on the market, this product will not take much of your time when it comes to installation. When shopping around for an RV AC, installation ease is one of the most essential factors to consider ensuring you can make use of it quickly. Another thing I liked about the RV air conditioner is its low profile and small footprint, which makes it a good pick to ensure that it won’t give too much pressure on the rig due to a heavy weight. A small footprint also makes sure you don’t have to worry about wasting fuel in your rig. I also like that its weight also makes it portable and easy to transport versus other models on the market are. On this list, this air con is one of the lightest suitable for you if you’re looking for top performance, yet a compact unit. 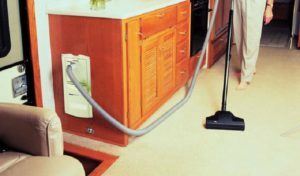 The DOMETIC Sanitation 143002P041 also has a heat strip, which is perfect for those who frequently travel with their RVs. 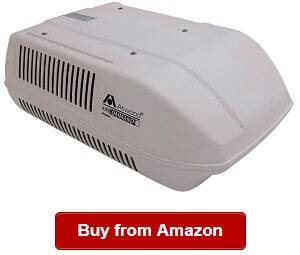 On a little drawback, this AC unit operates a bit noisier than other models on the market are. Its shroud is also a bit flimsy. If you’re looking for roof-mounted air conditioners, you might want to check out the Atwood 15027. It is one of the best air conditioners for the RV because of its solid performance and high quality components. The Atwood 15027 is a ducted aircon type that is ideal for many systems. It is a versatile unit that you can rely on it when it comes to ease of installation. I would also like to recommend the Atwood 15027 because of its compact and solid design. It has the convenient design that makes it a good choice for RV owners that want a unit that is not only easy to install but can also match or complement their RV decoration and design. It is one of those things that I liked about the manufacturer of the Atwood 15027. When shopping around for a good RV air conditioning unit, you should also look into its cooling capacity. This ATWOOD is a good choice because of its nominal cooling capacity or power of 13,500 BTU. It is enough to cool and maintain the comfort in your rig. In this case, your loved ones will not only enjoy a rewarding time together camping aboard the RV but also feel comfortable especially in the summer when the temperature can get too hot. While it has a good cooling capacity, the 15027 also is lightweight. It is one of those things that you will appreciate about it. What is in a lightweight aircon? It only means that it won’t add much weight in your rig as well as it won’t cause much fuel use. In this case, your recreational vehicle will remain fuel-efficient because the RV air conditioner won’t put too much pressure on it. The 6lb air conditioner with a great cooling capacity is one of the lightest recreational vehicle air cons especially for smaller RVs. I would also like to recommend it because it can operate quietly. It runs two times quieter than other models on the market can. I also liked that it has an accurate temperature control that also has a clear digital readout. Also, it has a wireless remote that lets us adjust the settings, including sleep timer. On a negative, this AC is not suitable for larger vehicles. But with its great performance and function, it is also worth the investment. When shopping around for recreational or residential rooftop air conditioner units, you should look for its efficiency and cooling capacity to ensure that it will work to cool the entire space but without drawing too much power. One of those I would like to recommend is that Mach Polar Cub 9.2 air conditioner for the recreational vehicle. The arctic white AC unit is one of the most reliable around because of its capacity reaching to 300 cubic feet per minute. If you have a smaller recreational vehicle, this aircon can be enough to cool down the interior for its 9200 BTU capacity. It is enough to keep the comfort of your loved ones in the summer when camping in your RV. With it, you don’t have to worry about the punishing temperature at this time of the year. So aside from reaping the rewards of camping outdoors, your family will also feel as if they’re home for the cool temperature inside your recreational vehicle. The Coleman-Mach Mach 8 Cub is also one of the top picks among RV owners because it is very energy efficient. 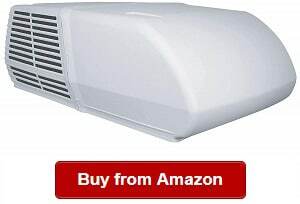 It is a reliable choice if you don’t want an air con unit that consumes too much power. In addition, it is lightweight that has a low profile standing only eight inches tall. With its small and low profile, it won’t add much pressure in your recreational vehicle; thus, you don’t have to worry about spending too much on fuel for a lightweight air conditioner like the Coleman-Mach Mach 8 Cub AC. I would also like to note that the A/C has a fiberglass base pan, which makes it even more lightweight. It also adds to the durability of this product. Fiberglass is one of the most durable materials around for a base pan, and thanks to the manufacturer to include that in the design and construction of the AC. I would also like to note that the product has a heat strip capacity 6000 BTU rating and operates with a quiet fan that can maintain precise nighttime cooling. You will also appreciate that the air conditioner has a quiet fan that can operate well when it comes to nighttime cooling. On a negative, the Coleman-Mach Mach 8 Cub is expensive. In many cases, it is better to buy a new instead of a used RV air conditioner so that you can ensure that you can use it for a longer time and that it is updated with the latest technology in cooling. One of the best choices around when shopping around for a new A/C for the recreational vehicle is the Coleman 48203C969 that has the ability of cooling 320 cubic feet per minute, one of the best in its class. You can rely on this RV air con to cool the interior of your vehicle without any hassles. I also love that it has an increased airflow that makes it an efficient unit for motor homes. The Coleman Mach 3 Plus 48203C969 RV Rooftop Air Conditioner is designed with large evaporator and condenser coils plus raised lance fins for heat dissipation. I also liked the versatility of the unit that it can be installed and used in many types of vehicles, such as travel trailers, fifth wheels, fold-down trailers, truck campers and so many more. This cooling unit can also be used in horse trailers provided they have roof support and suspensions. With such versatility, you can use it in many applications, giving you more out of your investment. If you’re looking to reap this reward, you might want to take a second look at the air conditioner for a recreational vehicle. I also liked that its motor is on its bulkhead, preventing any kind of angle distortion to its blower wheel. It is one of the best features of this unit that can also make sure there’s free turning action. I would also like to recommend the air con for its sealed shaft, protecting it against elemental damage. This feature also adds to the durability of the air conditioner. Another impressive function of the unit is that it can start well no matter the temperature. It can work even in humid and high temperature conditions. So in the summer, you can look forward to comfort in your vehicle if you have the Coleman Mach 3 Plus 48203C969. I would also like to recommend it because of its plastic drain, which is not subjected to corrosion or rust versus other models on the market are. On a negative, you need to buy a heater assembly because it’s not included in this purchase. When buying a new shroud for an A/C in your recreational vehicle, you should not just mind about the RV ducted air conditioner installation but also the reliability of the product when it comes to being compatible and valuable as a replacement shroud for the Coleman-Mach covers (11,000, 13,500 and 15,000 BTU covers). If you’re looking for a good RV AC shroud that can perform well even in humid and hot temperature conditions, you should not miss the MaxxAir 00-325001 on your comparison list. I find this product impressive because it is built to last. The polar white TuffMaxx A/C Shroud can replace the above-mentioned shrouds or covers without any hassles because it is very easy to install. You just have to follow the instructions to ensure correct installation of the shroud for your AC. Another thing I liked about the shroud is that it is built to last. It is one of the most durable covers to find for your Coleman Mach cover. I also liked that it has a rear fin guard that makes it more useful as a shroud for the AC that is exposed to the elements. When shopping around for a new shroud, it is one of the features to look for to ensure you’re getting more of your spending for this A/C part replacement product. When it comes to reliability, you can depend on the shroud that is made from thick and sturdy UV protected plastic materials. On a little drawback, its plastic materials might break over time. Aside from knowing Coleman mach air conditioner parts or reading about an RV air conditioner heat pump, you should also find good RV air conditioner covers that you can rely on to last for years. On the market, there are many choices of this type of product but not all of them are reliable to offer you with solid service. If you want to get the most value for your money, check out the ADCO 3023, one of the best RV air con covers that are built to last. It is made of quality and high quality materials ensuring protection of your rooftop air conditioner when it is not in use. As you already know, the RV AC is always exposed to the elements that might cause damage to it over time if you don’t keep your RV covered. When it comes to durability, you can check out the ADCO 3023 that is made of heavy-duty vinyl material that is resistant to outdoor and weather elements. The jersey-backed material can also ensure that your air conditioner is always protected from UV rays and contaminants that might cause its damage. 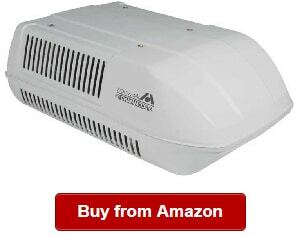 This RV A/C cover is one of the best around not only for its performance but also for its ease of installation. You can cover your unit within minutes with the white cover that has a cool and straightforward design to offer you convenience of use. You can also easily secure it using the draw cord. This product also has cool dimensions of 29″ x 14″ x 43.75″ (WDL). However, this cover’s vinyl material can deteriorate over time. The Camco 45392 is one of the best air conditioner covers for the recreational vehicle that can protect your investment from the harmful outdoor elements. It is made of durable and heavy-duty materials that can ensure long-lasting service. Durability is one of the features to look for when buying a new cover because it is always exposed to the rough outdoor conditions. That is why you have to look for one that is ideally made of weather resistant materials, such as vinyl. This product is one of those to depend on when looking for a durable cover that is also versatile enough to fit many models. The Camco 45392 can be used for different Dometic Brisk aircons. 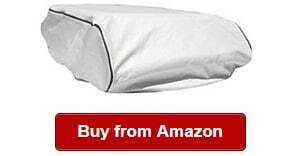 I also like to recommend the cover because it is easy to secure. This product already comes with a locking draw cord, which can ensure its perfect fit for your rooftop AC. It also has an arctic white color, adding to its modern and sleek appearance. It looks appealing and can complete your RV’s overall appeal. You don’t also have to worry about installation because this product is easy to install and use. You will also love that it is long lasting to ensure the most value of your spending. 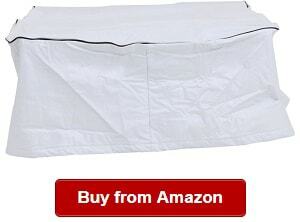 You can also rely on the cover that can keep out drafts on cold days. Overall, the Camco 45392 is one of the best picks for RV air conditioner parts that you can always count on. 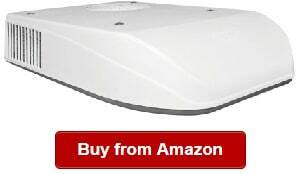 You should not miss it when comparing RV aircon covers on the market. It is durable and affordable and has a sleek and modern design. On a little drawback, the product has a limited compatibility. 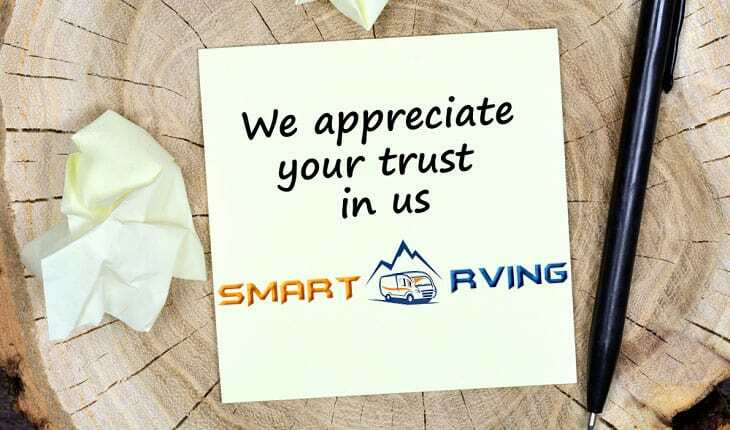 You should trust Smart RVing when choosing among the top rated RV air conditioners, such as a Dometic RV air conditioner because we’re seasoned in recreational vehicle camping, giving us firsthand experience in using different RV products, such as the best RV GPS. With our knowledge and skills in RV camping, we’ve also encountered the best products that we can always rely on for the convenience and comfort living or camping in a travel trailer, motorhome or recreational vehicle. When choosing an RV air conditioner, we’ve considered different factors, including the type and quality of the unit. As while there are many picks in this category on the market, we recognize that not all of those cooling systems are reliable enough to work well for us. For example, some units are with higher BTU ratings than others have. Some also are built with compact and heavy-duty materials, and others are not. For this reason, we understand that not all air conditioners are reliable and not the same with one another. So in this review, we have only picked the best among them to ensure you will get the most of your investment and will be satisfied with the unit’s performance. We do hope that you can select the right one that can offer you comfort, convenience, top performance and quality. Start choosing your RV air conditioner using our list above. The small RV rooftop air conditioner is one of the most important appliances in your recreational vehicle because it can offer comfort. It runs using AC power that comes from the socket, which is plugged into a shore power or a generator. However, it is expensive to run the A/C using a generator, so might want to look for a way on how to be more energy efficient. One way to do that is to use a solar panel/s, which can convert light energy from the sun into electrical power that can operate the air con. The appliance works with air vents located on the roof for the most of them, allowing them to work efficiently when it comes to cooling the rig’s interior space. So even in long drives, the A/C can operate and keep the ideal temperature inside your rig. The air conditioner can remove the heat from the inside to the outside of the vehicle. For the most part, the RV air conditioner can make sure that the summer temperature can be bearable. As you know, the summer’s temperature can be so hot that it can cause discomfort, but you will not have to worry about it if you have an RV air conditioner that can help in keeping cool temperature inside your rig. And if you’re going to choose one of the top picks we have featured in today’s guide, you can be certain that you’re going to use a reliable unit for your vehicle and for the comfort of your loved ones. When shopping around for RV air conditioners, one of those things to look for is the type of unit you will be getting. At the very least, there are two types of air conditioners for the recreational vehicle – the ducted and the non-ducted type. Before selecting yours, you should know their basics. Let us start in the following. If your vehicle is large, you might want to get a ducted type of air conditioner because it is more efficient than the other is when it comes to controlling the temperature in the different rooms of your rig. As it has a ducted system, it can improve cooling in multiple parts of your vehicle. This type pipes into the ceiling, walls and floor. But if you have a smaller RV, you can opt for the non-ducted type that does not have to keep ideal temperature in different rooms. This type works just perfectly and don’t require piping, too. The air is simply blown out of the AC’s bottom, so no need for a duct system. There you have the basics to know about the two types of recreational vehicle air conditioners. So again, you might want to opt for the ducted type for a larger RV but a non-ducted system for a small one. Bottom line, you just have to consider your needs and see what can realistically provide you with those. To begin selecting the right type of RV AC system, you might want to refer to our reviews section. When camping about our recreational vehicle, the last thing we’d like to experience is the discomfort caused by a too hot temperature. This is common in the summer. However, this season is also when the most fun season for camping is. That is why you should not let a scorching weather stop you and your family from enjoying this wonderful time of the year to go camping, do outdoor activities and sightsee aboard the RV. Today, it is not a problem anymore because you can get a high quality air conditioner for your rig. It has a great cooling capacity that ensures cool air remains in the interior of your vehicle. Without it, you might not be able to imagine the discomfort that your loved ones will suffer from that will the enjoyment they could have for the summer camping activities. The best AC unit for the recreational vehicle is also specially designed and made to handle the shocks and vibrations in the rig. RV air conditioners are meant for vehicle use, so they’re made with heavy-duty materials. Rooftop air cons can also deal with the outdoor elements as well as UV rays because of their UV protected components. By having the RV air con, you can have peace of mind that your rig will not just stay cool but will also not break down that easily because it is not the same ones or models for home use that might not be able to deal with vibrations and shocks as well as outdoor conditions. In addition, if you’d get an RV air conditioner, you can be certain that your indoor air will stay clean that is valuable especially if you have loved ones suffering from asthma and allergies. 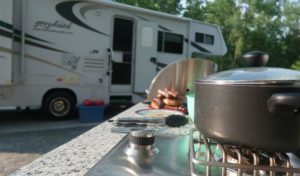 Summing up, there are many benefits to buying a recreational vehicle air conditioner that you can take advantage of – and that’s mostly for keeping cool temperature in your rig for the comfort of your family. In order to get the best air conditioner unit for your vehicle, you might want to keep reading in the following for a buying guide. There are certain factors to consider when buying a new RV air conditioner. As you may know, no two of them are alike in terms of performance and quality. Also, not all of them will suit your needs – including cooling capacity and so on. That is why we have put up the following for your guidance in choosing the best RV air con that is right for your rig requirements. For this factor, you might want to opt for an air conditioner that is dual use with a heat pump. For this reason, you have to ask yourself as to how often you’re going to use the AC. Will you use it only for summer or also in the winter? If you’re looking for a more versatile unit, you might want to choose one that comes with a heat pump to ensure it can offer both cooling and heating functions. So are you are RV owner that uses your rig all-season? If you answered yes to this question, then you must look for that unit that can also help you fight versus winter nights. But if you only use the RV in the summer, you don’t need an A/C with a heat pump. Another important consideration when finding a new RV air con is its performance and quality. You should get the most of your investment, which is why it is essential that you compare your options well and find the right unit to match your needs. Customer reviews, guides and forums are some of the best channels to check on what users are saying about the product they bought. As just like when buying anything, you should not settle for one just because it is affordable. Instead, you should be able to narrow down your choices based on quality and price. Next thing is to check on the performance, you should look for the right BTU rating, as we have discussed earlier. You should also check on the quality of the components, which have to be resistant against harsh weather elements and outdoor conditions, including vibrations and shocks. Just like when shopping around for the best RV solar panels, you should also narrow down your choices by first determining the budget you can and willing to spend for a new AC. You can check out our top picks, which belong in different price categories, and then narrow them down based on what you can afford. This measurement pertains to the energy amount that the air conditioner is using per hour, one of the main factors to consider when choosing a new RV air con. It will help you select the right unit that will suit your requirements. So before getting a new AC, you should know the BTUs it will need to operate per hour, or else, picking the wrong one might end you up with more spending. It will make you feeling frustrated because you will be spending more than what you actually needs, and that is a no-no. Also, you have to remember that an AC will run for a period of time in order that you achieve what results you’re looking for. So you don’t have to buy an AC with a very high BTU rating, or else, you will also waste much-needed energy. On the other hand, an air conditioner with not much power will also cost you more money as it will be running longer. Without even saying, you must choose an AC that has enough power to run. At the very least, a unit with 13,500 BTU is sufficient for most recreational vehicles, and it is often a standard. But then, I would like to suggest getting an air conditioner with a higher BTU rating if you’re camping often in the summer. But then, you might want to pick an air con that has a longer BTU rating if you are not going to use the AC very often. There you have some things to remember when buying a new air conditioner for your camper, travel trailer or recreational vehicle. Be able to compare your choices and weigh them well to get the air con that’s right for you. Q: What are good RV AC brands? A: There are many good air conditioner brands for the recreational vehicle, and a few of them include the Dometic, Airxcel, Atwood, Advent and Coleman. These are only some of the top options that we’ve featured in our reviews, so you can start narrowing down your choices and selecting one that is right for you. Q: Do RV air conditioners run on propane? A: Recreational vehicle air conditioners are running off 110V AC through generator or shore power. In most cases, they do not operate on a battery or on propane. And as a control voltage, the RV AC might need 12V direct current energy. Based on some sources, though, there is some ACs that run off propane especially in situations when the camping site does not have shore power or electrical source. Nevertheless, you should ask about this spec from the manufacturer depending on the unit you’re choosing. Q: How many amps does an RV AC draw? A: As you might already know, recreational vehicle appliances are drawing more energy and requiring more amps to start than running amps. In the case of an RV air conditioner, one may need 16AMPS starting power and then 13AMPS operating or running power. 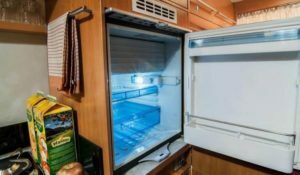 Q: What size RV ac do I need? A: This factor is important to consider when buying an RV air conditioner. For example, a too large unit for a small rig may be costly and will just consume too much energy. On the other hand, a very small unit for a large vehicle might not be able to cool a big RV with multiple rooms. In this case, you should be checking on the size of the RV AC you need before making a purchase. When it comes to an RV air conditioner, the size will depend on the British Thermal Units (BTUs), which pertain to the energy amount that the AC will use per hour. So when comparing your choices, check on the BTU and refer to our discussion earlier about it. Q: How to charge RV AC? A: You will need to recharge your AC because it runs on refrigerant that runs out over time. To do it, you should first lower the power supply to your appliance. Remove the shroud screws with a socket. When done, start lifting the lid to prevent damage to the interior parts of the AC. Check the refrigerant gauge before unscrewing the port and then add the needed refrigerant. Make sure it is the right refrigerant for your air con. Just add the right amount slowly. While you’re adding it, you should notice changes in temperature in the RV and the unit. Once done recharging the AC, you should then check that the temperature difference is about 20 degrees different. 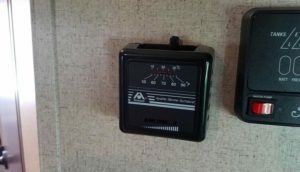 When done, restore power and take note of the RV temperature in order to check that you have charged the AC correctly. Q: How to install RV AC? A: There is no specific answer to this question. It will vary from one model or maker to another. It will also be base on the type of AC you have chosen. But in general, it is not time-consuming to install the AC and you will be able to do it yourself. Finally, check the maker instructions and follow those closely to ensure proper installation. If you think you cannot handle this task, you can contact a professional to do it for you. 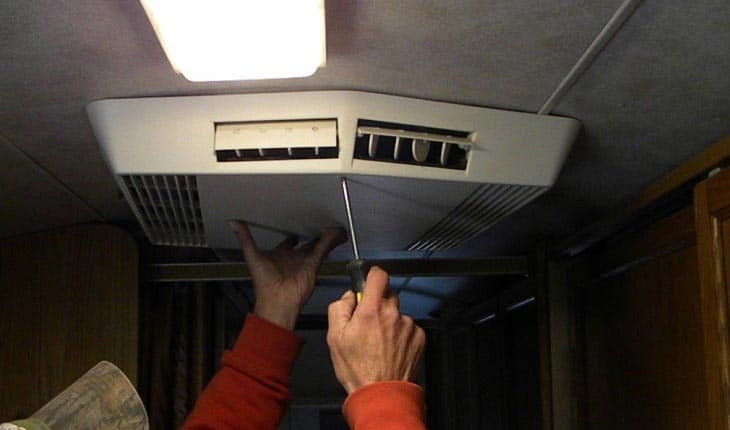 Q: How to replace RV AC? A: Replacing the air conditioner is easy. You just have to pick a new one based on the factors we have discussed above and then figure out the unit you want to replace an old air con with according to your needs and rig’s size. 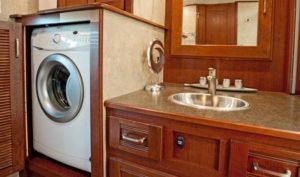 Q: How to clean an RV AC? A: You can maintain ideal temperature in your rig and keep the efficiency of the unit by performing regular cleaning on it aside from cleaning/replacing the filter. By cleaning regularly, you can make sure that the RV A/C parts, such as evaporator and condenser will work properly and extend lifespan. It is easy to clean the rooftop aircon. Turn the power source off and then remove the nuts & bolts that secure the AC shroud. Using plastic bags, you can cover the electrical connections. Apply a cleaner to the coils and leave it for about 15 minutes. After this time, you can start flushing out the loose debris. For a couple of hours, let the coils dry, or use a fan or vacuum to dry them faster. When done, reposition the shroud before turning the power source on again. Q: How to maintain RV AC? A: There is no specific answer to this question, but it boils down to how often your RV is used and how often it requires cleaning, so maintenance depends on usage. When it comes to the components, you should also take note of the wind, snow, sun and rain that might damage the AC. You should also inspect for water intrusion and leaks. Again, if you’re not confident to do it yourself, you should contact a professional to maintain the AC. Q: Do I need an RV AC cover/ shroud? A: Yes, you need an RV A/C cover or shroud to keep the unit from the elements, including the sun’s harmful rays. By having one, you can be certain that your AC is protected from harsh conditions, ensuring its long lifespan. Knowing as much as you can about the best RV air conditioner will help you come up with a good buying decision. So when picking an excellent RV air conditioning unit, you might want to refer to this guide. 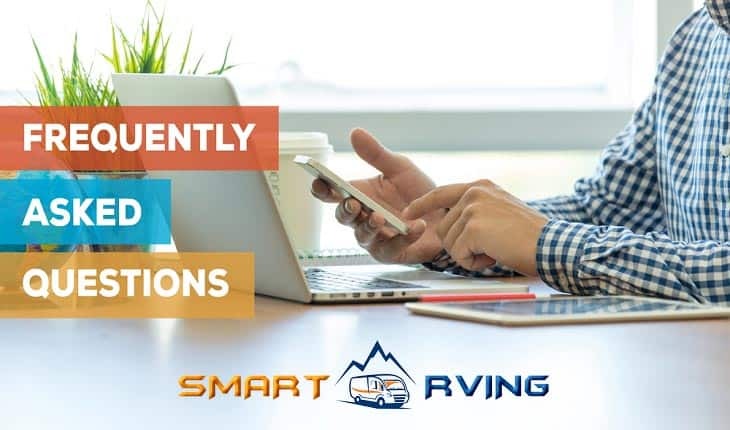 Be able to compare and weigh your options well so that you can shop for what you really need when it comes to cooling your interior efficiently whether you’re buying a ducted or non-ducted type of RV air conditioning unit. 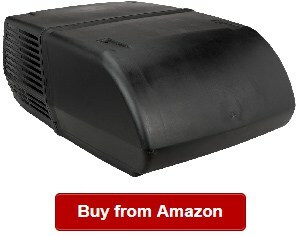 Enjoy shopping for the right RV roof air conditioner for your recreational vehicle today!